Betfair is well-known for operating the world’s largest online betting exchange and one of the biggest and most popular Sportsbooks. The operator’s versatile offer also includes online poker, casino, and bingo. Betfair Poker launched in 2004 and was originally a stand-alone website. 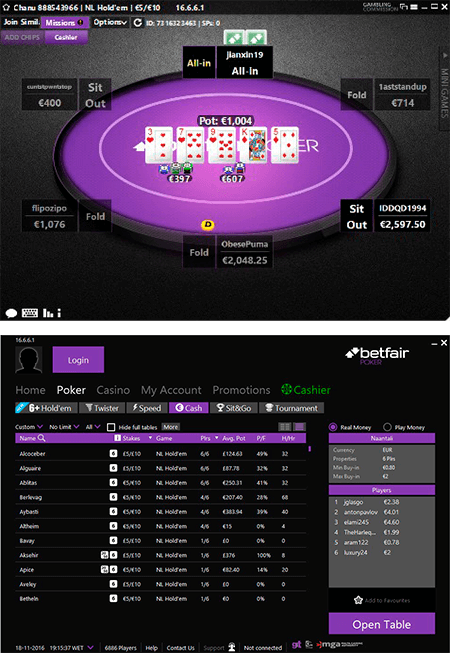 Then it became part of the OnGame network until in 2013 Betfair Poker joined the massive iPoker network. This move resulted in significantly better traffic on cash games, more tournaments and bigger guarantees, and the addition of Speed Poker to the existing poker offer. The iPoker network features a number of household names such as bet365, PaddyPower, Ladbrokes, Coral, and William Hill. As you can gather from that list of sportsbook giants, most of the players in the network are regular bettors, who only play poker recreationally. Therefore, the competition is pretty soft all the way up to the high stakes. You can download Betfair Poker’s software, which is available for Windows. Unfortunately, Betfair does not offer a Mac or Linux software. However, Mac users can play on the Windows version using Apple’s ‘Bootcamp’, which allows them to run Windows on a Mac computer. You can also play on the go using Betfair Poker’s mobile app. It’s compatible with Android devices and iPhone/iPad. You can get the app from the Apple app store or Google Play. BetfairPoker offers new players a generous signup bonus of 200% up to €1,000 and you can also take advantage of the iPoker rakeback offer of up to 35% based on points-for-cash exchange system. For more information on the poker games, traffic, and Betfair Poker rakeback, please read our full Betfair Poker review below. One of the perks of playing in the iPoker network is you never have to worry about the traffic. Only big websites with more than 5,000 players are even able to join the network, so the player pool is quite large. Most of the traffic comes from Europe, and especially the UK, so the traffic peaks during the evenings UK time. Betfair Poker offers Texas Hold’em and Omaha variants, and also 6+ Hold’em. At NL Hold’em almost all of the cash tables are 6-max and heads-up with a few 9-seaters that barely get any attention. 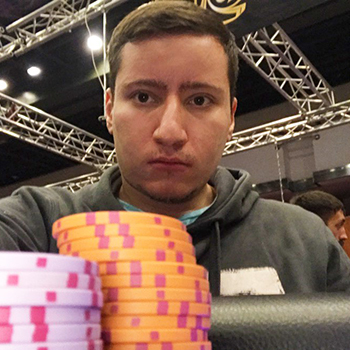 There is plenty of action on the micro and low stakes with dozens of tables running on NL20, NL40, plus another 8-10 tables on NL50 and NL100. You can also find another 6-7 full tables at all times on NL200 and NL400. The traffic whittles down only slightly at NL600 where only 5-6 tables fill up, and the numbers are similar on NL1000. The heads-up traffic is pretty poor at micro stakes and starts getting better at low and mid stakes, where you can find a couple of tables to play. But in general, there isn’t much interest, which shouldn’t come as a surprise. Most players at Betfair Poker are amateurs and they lack the necessary skill to compete at the heads-up tables. As for Omaha, you can find 3-4 tables at micro and low stakes, and 1-2 at mid stakes. Similar to NLH, there isn’t much going on at the PLO heads-up tables. The fast-fold variant Speed also has a good traffic at most times. The highest traffic can be found at NL50 up to NL200, with 50-70 players hitting the tables at peak hours. The SNGs are also favored at Betfair Poker and they fill up pretty quickly at micro and low stakes. Medium staked take a bit more, but you can still get decent action. The traffic dies down at the high stakes and you’re going to need a lot of patience to find an opponent there. Betfair Poker also runs more than 200 tournaments every day including a fantastic Sunday lineup of large guarantees. Most of them are NL Hold’em, with the occasional PLO tournament thrown in. Betfair Poker’s poker client is very modern with top-notch graphics and navigation. The design and color scheme are a bit in-your-face, but that doesn’t take away from the gameplay. HUDs are not frowned upon at Betfair Poker, so you can use Hold’em Manager and Poker Tracker. Betfair Poker uses a complicated, partially SBR (source based rake) system, which is designed to benefit the recreational player. The total rake assigned to a player is called RPV (real player value), and consists of 50% WC rake (weighted contributed) and 50% SBR. The WC is the actual rake taken, as counted by HUDs. The operator charges between 2% and 4% on fixed limit tables up to a max rake of $4.00 and between 5% and 6.66% on pot limit and no limit tables up to a max rake of $4.00. Betfair Poker greets new customers with a 200% deposit bonus up to €1,000, which equals 20% rakeback. Depending on your VIP level, you get a different Status Points multiplier, which determines how many VIP Poker Points (VPPs) you will collect. Bronze and Silver VIP levels have a multiplier of x3, while the Gold level offers a multiplier of x5.25, which means you get a lot more VIP Poker Points when you reach Gold status. VIP Poker Points are exchanged for cash at a rate of 3,750 VPPs per €10 or currency equivalent. 3,750 VPPs are also the minimum you can convert to cash in a single exchange transaction. VPPs are valid for 6 months and if they’re not redeemed during that period, they will expire. If you chose PokerProDeals as your affiliate to the poker room, you will have an opportunity to receive fixed 35% rakeback without participating in VIP system of the poker room and first deposit bonus promotion. Contact us in order to know the terms of receiving this rakeback. How to register in Betfair Poker?